When a dredging contractor removed biosolids from a storage lagoon in Montana in preparation for re-lining, a significant amount of biosolids remained behind after the lagoon was drained. So the contractor contacted Godwin Pumps to assist by providing a portable pump that would remove the remaining material quickly and efficiently. 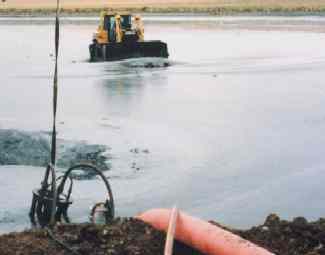 A sump area was created to collect the material to be pumped out of the lagoon and a dozer was employed to push the semi-fluid material to the sump. The Godwin 8-inch Heidra¨ 200 hydraulic submersible pump and powerpack, hydraulic hose and 800 feet of discharge hose were used to move the thick sludge out of the storage lagoon to an adjacent area for dewatering and disposal. For eight days, the Heidra 200 hydraulic submersible unit pumped thick sludge at a rate of more than 1,000 gpm.